Winemaker’s Notes: Fresh and fruity with aromas of young strawberry, raspberry, and notes of lilac and violets. Smooth and versatile. Perfectly balanced with just a hint of fruit and floral on the finish. 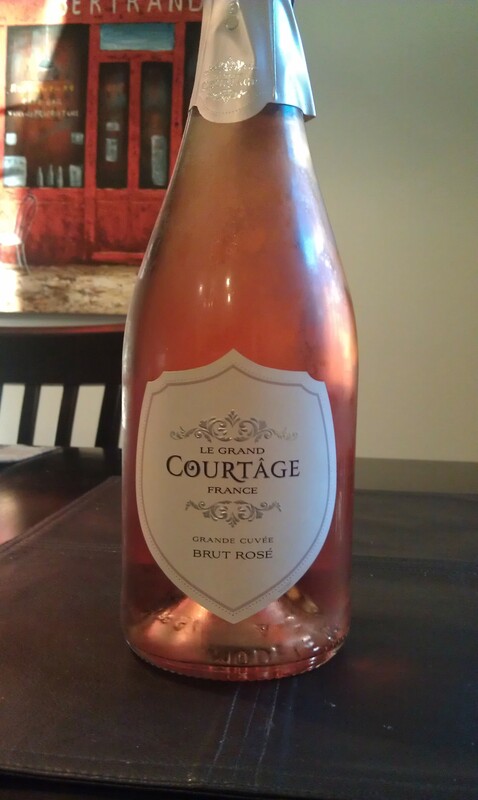 A courtship of delicate flowers, red fruit aromas, and baby bubbles. Pairs with an array of foods, including spicy Asian dishes, risotto, BBQ, beef, lamb, duck, game, chicken, prosciutto, seafood, pizza, or soft cheese (like brie or goat). My Review: French wines is one of those areas where I’m still building up my knowledge base, as are sparkling wines. So when I was approached about trying a sparkling French wine, you can be sure I jumped at the chance to not only try something new, but to try something that I was trying to expose myself to more in an effort to feel more knowledgeable about it. Receiving two bottles, this Rose’ Brut and another (Blacn de Blancs Brut), I chilled them down and decided to open the Rose’ recently after a long day that simply demanded bubbles, my wife and I popped the bottle open to enjoy with some dinner. The wine was a nice orangish-pink in the glass, a color I tend to see in rose’ wines that I favor, which I hoped would lead to good things with the wine. It took a few minutes for the wine to really start giving off aromas, but once it did I picked up strawberry and raspberry, but none of the more subtle floral aromatics that were advertised. In the mouth I got more raspberry than strawberry, though the latter was certainly present, and found the wine to be nice and crisp and to indeed have small bubbles, something that I find I prefer the more I drink sparkling wines. Dinner consisted of tilapia in the oven with a topping of pesto and a side mixture of brown rice and quinoa. While the tasting notes didn’t specify a seafood pairing, I think were I to do it again I’d pair the wine with a darker fish – salmon or swordfish or the like, or perhaps go straight the the BBQ option since I think the raspberry flavors I got would pair really with some some nice saucy BBQ. All that being said, I did enjoy the wine, and if it didn’t exactly blow me away, neither did I find it disappointing. I wouldn’t go so far as to call it memorable, but I also wouldn’t have had a problem sharing it with friends, and the price-point certainly makes it a good option as we get closer to the holidays and parties that require bubbles for those that don’t want to put out bottles of incredibly cheap sparkling wine, but also don’t want to break the bank.